A good day for me is usually one involving quality time with the kids, exercise, and some tinkering in the kitchen. At the moment, I’m still high on endorphins from this evening’s run. I had a pleasant and fruitful day with the kids, and the Char Siew we made for dinner turned out exceptionally well. So it’s been a good day. I first made Char Siew some years back, when it was part of the menu at a family dinner I cooked to celebrate my mom-in-law’s birthday. Back then, I only had a table-top oven which was relatively small in size. But it was a good microwave-convection combination oven, which in those days didn’t come cheap. It was my first oven, and I have fond memories of learning how to bake and roast with it. I’m glad it’s gotten a new lease of life in another household with someone who also enjoys cooking. But I digress. 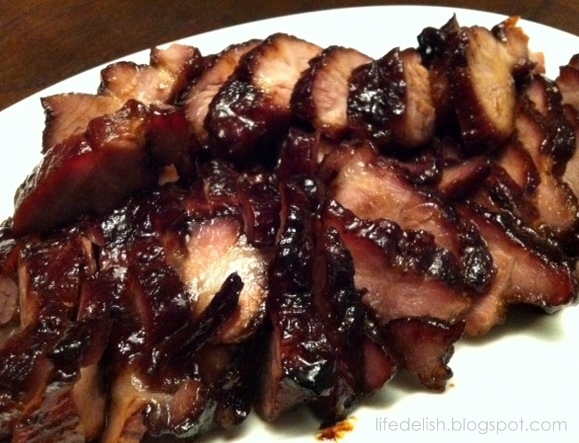 I remember wondering how I should make Char Siew, then looking for a recipe online. That’s when I discovered Lily’s Wai Sek Hong, which is a useful resource for Chinese and Asian recipes. This Char Siew recipe was originally based on Lily’s recipe, but I’ve experimented with it and tweaked it as I went along so the quantities and method aren’t the same anymore. I actually think it’s pretty easy to make, and once you can do this, you probably won’t want to buy char siew from the neighbourhood roast meats stall again. There are two ways you could cook this: If you want very succulent Char Siew, but without the charring, you can simply place it in a tray (line tray with foil first, otherwise it’ll be hell to clean) in the oven at 220 degrees celsius, first covered in foil for 15 mins, then remove the foil, return to the oven for a further 15 minutes, then glaze it and return to the oven for a further 12 minutes or until it the pork appears shiny. The Char Siew turns out really juicy and tender this way, but you don’t really get any charred bits. If you like it charred, then place the pork on wire rack fitted over a roasting pan (again, line pan with foil), add some water into the pan (about 1cm depth) and just roast on 230 degrees celsius covered with foil for 10 minutes, then, remove foil, glaze and continue to roast (uncovered) for another 20 minutes, checking to ensure it doesn’t burn. I prefer the first method, as the meat retains much more moisture, and because the marinade and glaze don’t get burnt off as in the case with the second method, there’s much more flavour as well. What I’m posting is the first method, but if you like your Char Siew charred, you could try the second method I’ve mentioned. Mix all seasoning ingredients together and marinade pork in it for about 1-2 hours. Place pork in a tray (line tray with foil first) together with all the marinade and cover tray with foil, then put in the oven for 15 mins at 220 degrees celsius. Remove the foil covering and return to oven for a further 15 minutes. Mix glaze ingredients together in a bowl and brush glaze all over pork thoroughly, then return to oven for a further 12 minutes or until the pork appears shiny. Let stand for 20-30 minutes before cutting into slices and serving. I’ve put off starting this blog for long enough I guess. It’s so much easier and quicker to just post a picture on facebook with a short caption. But then this allows me more room to share anecdotes, recipes and thoughts on food, cooking, perhaps even life and love. Anyway, to kick this off, allow me to share with you a recipe for Roast Duck, one of my favourite dishes. I love duck. Duck Confit, Smoked Duck, Teochew Braised Soya Sauce Duck – it’s all good. 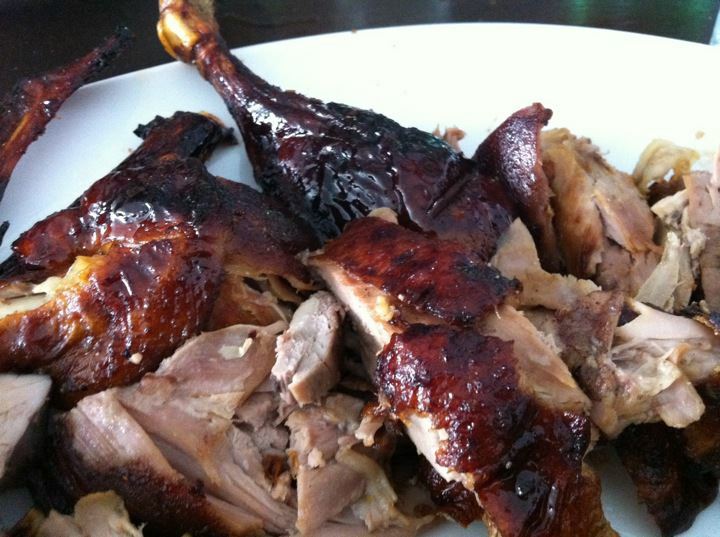 But to me, Chinese Roast Duck is hands-down the best. I’d always wanted to learn how to make it, how to get the skin so thin and crackly, while at the same time keeping the meat moist, tender and juicy. I’d done Confit and Braised Soya Duck, but never Roast Duck. After all, it only takes a short drive out anywhere to get pretty decent and affordable roast duck here in Singapore! But you see, I enjoy the challenge of trying my hand at cooking what I like eating. Just so I know I can do it myself if I wanted to. So yesterday I finally did it. 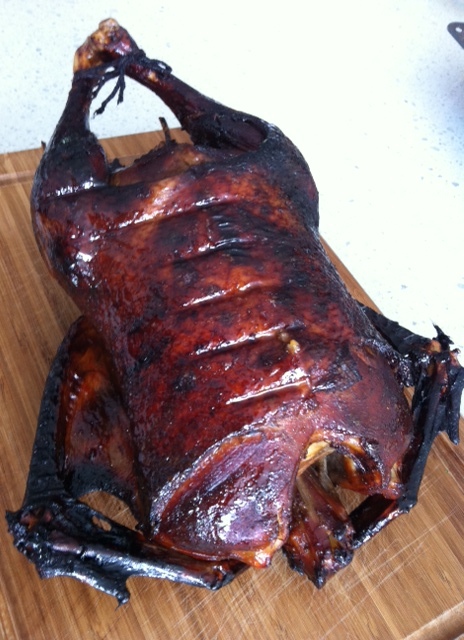 Roast Duck. It was easier than I’d expected, and what a hit it turned out to be! This recipe is based on Tyler Florence’s Chinatown Steamed and Roasted Duck recipe on foodnetwork.com. I tweaked slightly the quantities for some of the ingredients but I followed the method exactly. The end product was a mouth-wateringly sweet, crackly skin, and tender, juicy, flavourful meat bearing the aroma of orange, ginger and spice. My two girlfriends and I were smacking our lips and licking our fingers as we polished off one entire duck. Clean duck, trimming and removing fat, feet, head and neck. Rinse and dry thoroughly with paper towels. Mix Dry Marinade ingredients together and rub all over the duck, inside and out. Leave in fridge for a couple of hours, or overnight. 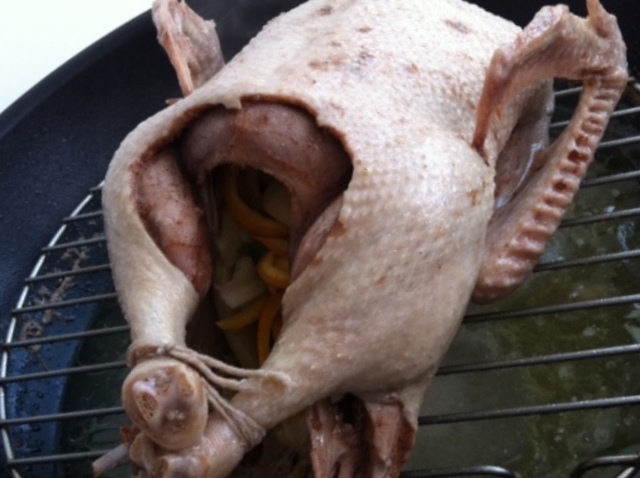 Stuff Aromatics into the cavity of the duck, tie the legs together, pierce all over the skin on breast side (using a skewer), place duck on a wire rack breast side up in a wok/steamer filled with about 1.5 to 2 inches of water, then cover, and steam for 45 mins. 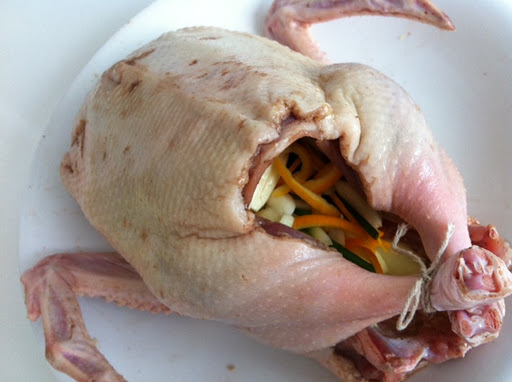 This is to render the fat from the duck. At the same time, steaming shrinks the duck, which also helps get us that crispy skin when roasting. Heat the Glaze in a small saucepan till boiling, simmer 5 to 10 minutes until thickened slightly, then set aside. After steaming the duck for 45 minutes, remove it from the wok or steamer. Place duck on a wire rack over an oven-proof tray, and baste with the glaze thoroughly, before placing in a preheated oven at 190 degrees celsius to roast for 1 hour. Baste the duck every 20 minutes while roasting, and tent with foil if necessary to prevent the skin from getting too dark.